Best Selling High Fashion Pendants & Earrings now come in sets at a discount. 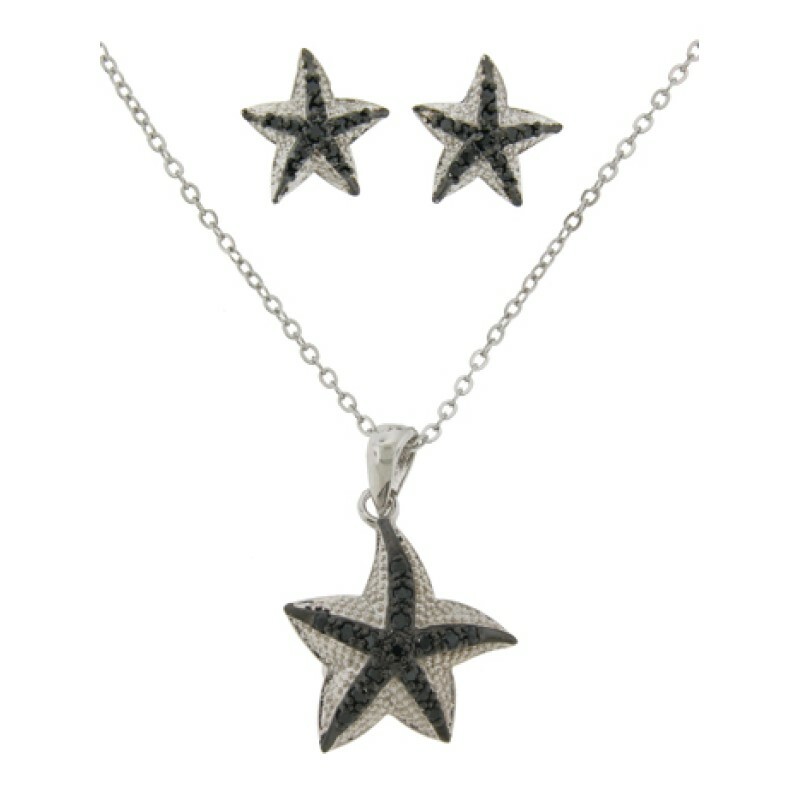 This lovely Designer two tones Pave Starfish set is rhodium plated; this fine jewelry set is accented with Swarovski CZ in a designer style. This high fashion jewelry is fully finished on front and back. The pendant is 1 1/4 and matching has earrings; the pendant comes on a 16" adjustable fancy designer chain, with a 2 "extension; the earrings comes carded, the necklace is packaged. Search 3498 for matching jewelry from this collection of high quality jewelry, more colors and to buy these items singularlyThe Starfish represents the Virgin Mary (Stella Maris which means Star of the Sea) who lovingly creates safe travel over troubled waters and is also seen as an emblem of salvation during trying times. The star as well as the Starfish are seen as celestial symbols and as such, they represent infinite divine love. In addition to love, the Starfish also holds characteristics such as guidance, vigilance, inspiration, brilliance and intuition.